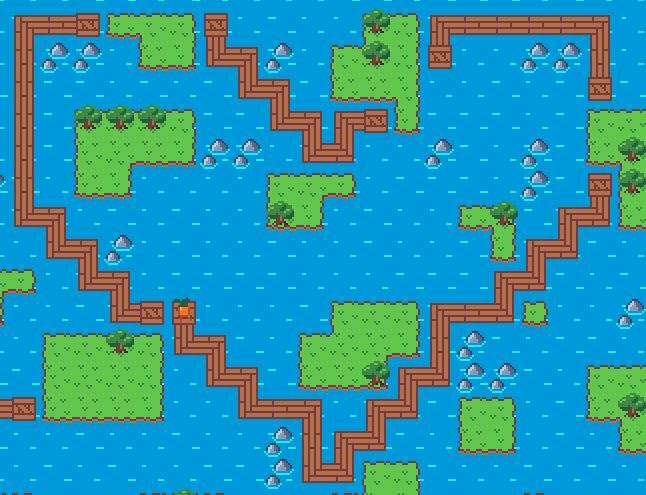 It's a puzzle-game where you have to build bridges using wood to go from islands to island until reaching the level's exit. I, Cawotte, programmed it and realized the game and level design. Gardrek, the 2D Artist who made the graphics. Sunmachine, Sound designer, who's done everything audio related, from music to SFX. Not everything is from me though, like a script to set the camera as pixel-perfect, and some editor asset for UI ( TextMeshPro, free on the asset store ) and animated/random/rule tiles ( from Unity2D-extras ). > Unzip the file, put it in a nice folder, and launch the .exe! > Or just click "Run Game" on top of the page to run it in the browser ! A bit more laggish compared to the download build though. Impressive puzzle design for a game jam. Really enjoyed it. Wow, just stumbled upon this, it's so cute and relaxing! An awesome example of a great single mechanic used in interesting ways, great job! This is a really neat little puzzler, and a great laid-back asthetic. Great job! nice stuff! i like the relaxing ambiance and the puzzles are well designed. Good game, the carrot with legs can create bridges and reuse them to reach other islands in search of keys and pennants. And the sandbox mode as a reward at the end, is a good addition, although not for a long time.